Originally offered as the ?Secret Star Wars Action Figure? mail away offer, This figure made its carded debut on The Empire Strikes Back 31 back card. Comments: If there?s one thing that can be said about the bounty hunter known only as Bossk, its that he?s creepy. Even if it wasn?t intentional, the Lucasfilm designers came up with a character that works fairly well as a (then) modern-day version of Frankenstein?s Monster. Maybe not in the literal sense, but when one factors in his gangly form, hideous face and complexion, and his affinity for fashions many sizes too small, a solid comparison can be made. Kenner certainly stayed true to the character?s design when they made this figure. In fact, he was so repugnant that Kenner was too frightened to picture him on the card backs ?when he was featured as the first The Empire Strikes Back send away figure- and opted to instead refer to him as the ?Secret Star Wars Action Figure?? Well, maybe that isn?t really a fact, but Bossk sure is creepy. 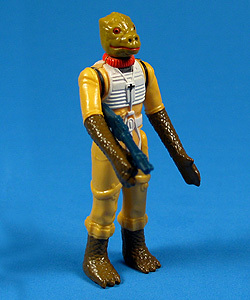 Major Variations: Though all vintage figures have minor variations, the only notable variation on the Bossk figure is in the plastic used in the head mould. 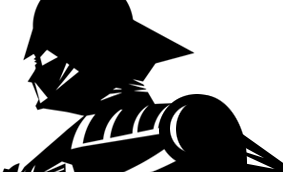 The figure can be found with either a green or orange hues in the plastic of its head sculpt. Neither is harder to find than the other.